Engineers responsible for municipal or industrial water storage, disinfection or effluent treatment systems will find the FlexSwitch® FLT93 Flow Switch from Fluid Components International (FCI) reduces pump repair and extends pump life by detecting dry running conditions. Fluid Components International (FCI) announces the establishment of Fluid Components Saudi Arabia, a joint venture with GAS Arabian Services. FCI’s compact thermal flow meter line has been expanded and improved with an all new, advanced electronics design that features the addition of Hart, Version 7, digital bus communication and more. Engineers responsible for oil/gas production at remote field sites that lack easy access to electric power will find constant power technology thermal mass flow meters from Fluid Components International (FCI) can provide a solution to their gas flow metering needs. FCI has successfully installed 20 of its rugged Model CL86 Plus Spent Fuel Pool Level Instruments (SFPLI) in 6 different plants located throughout China. As a reliable solution to flow measurement problems in large ducts with hot dirty gases, the rugged MT91 Series Flow Meter from Fluid Components International (FCI) takes the heat and provides precise, repeatable measurement to meet stringent environmental regulations. Engineers searching for a precision flow/level/temperature switch for use in liquid, air, gas or for interface service will find the FLT93 Series FlexSwitch® from Fluid Components International (FCI) provides a highly reliable solution in a wide range of applications. The new ST100 Series Thermal Mass Flow Meter from Fluid Components International (FCI) with FCI’s Verical In-Situ Calibration Verification System combines precise air/gas measurement capability with the convenience of in-situ calibration verification. The ST100 Series is a thermal dispersion technology gas flow meter that combines feature- and function-rich electronics with the industry’s most advanced flow sensors to achieve a truly state-of-the-science flow metering solution. Our Green Energy Applications Guide describes several applications where FCI flow meters, flow switches and level switches are typically installed. Our products can help optimize process performance, measure and report for regulatory agency compliance, and more. Download this guide to learn more about recommended engineering practices with diagrams and specifications for straight-run, installation orientation and depths, as well as use of flow conditioners as an engineering solution for FCI single-point, thermal dispersion flow meters. Learn more about our FLT93 Series with this flow switch guide. The FLT93 Series flow switches are found in continuous operation in the most demanding and critical process and plant applications. Download our Flare Meter Guide to learn more about our flare flow meters. Our flow meters provide plant operations with a tool to signal abnormal process changes, early leak detection, and report on flared gases to comply with environmental agency reporting. Download our FCI Flow Calibration Services Brochure to learn more about our state-of-the-art flow calibration laboratory. Our lab has the versatility to quickly transition through a wide range of calibration fluids, line sizes, and process connections. Download our Field Service Brochure to find out more about FCI’s worldwide customer support team. Our team has the product, application and installation engineering expertise to support site staff with timely, quick and accurate on-site field support. 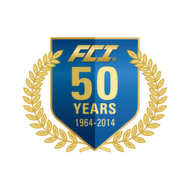 Download our FCI Product Line Brochure to learn more about our products and patented thermal dispersion flow measurement technologies. The AS-FT Flow Transmitter from FCI Aerospace features a rugged, highly reliable thermal dispersion technology sensor design that is ideal for mission-critical air, gas and fluid monitoring systems on commercial and military aircraft. Precise Flow Monitoring Also Reduces Plant HVAC Emissions—Plant engineers will want to learn more about the advanced ST98 Air/Gas Flow Meter from Fluid Components International (FCI), which is ideal for optimizing the fuel-to-air ratio for boiler control. FCI's Model ST100L Air/Gas In-Line Thermal Mass Flow Meter with Vortab® Flow Conditioner from Fluid Components International (FCI) provides accurate flow measurement without the long straight pipe runs required by other meters. The FS10A Analyzer Flow Switch/Monitor from Fluid Components International (FCI) has received FM Div 1/Zone 1 Approval on all remote probe configurations. Fluid Components International’s ST100 thermal massflow meter was designed for application in aeration basins. The new ST102A Air/Gas Thermal Mass Flow Meter from Fluid Components International (FCI) features an advanced dual-element averaging system, improving installation repeatability and accuracy for larger diameter pipes and ducts. Fluid Components International's (FCI) ST100 Series Thermal Mass Air/Gas Flow Meter is now ATEX and IECEx approved, assuring safe operation in potentially hazardous environments. The ST100 Series Flow Meter combines flow sensing performance with feature- and function-rich electronics. The ST100 features a plug-in card replacement that can be changed out by technicians in the field to adapt to a plant’s changing network communication needs.